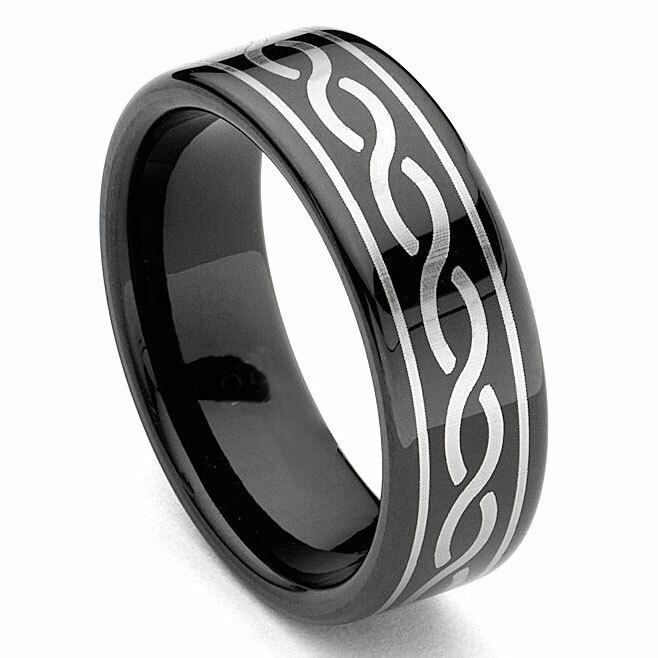 This dazzling black tungsten laser engraved celtic ring is bold beyond bold. Definitely a very unique ring for a very unique person. Utilizing a TitaniumKay first with black tungsten, laser engraved with a celtic design, to create the ultimate in individual statements. Manufactured with comfort fit design the men's ring never needs to be taken off. There are many celtic designed rings of precious metals such as gold, silver, or platinum, but none stand out and have the visual appeal as this one. The silver metallic celtic pattern against the black tungsten makes this a must have ring for the person who likes to be noticed, or who values owning something very few others also own. As with our other tungsten rings you never have to worry about it being destroyed or even scratched as the strength and durability our unsurpassed. We offer a 100% Lifetime Warranty...Enough Said! The ring was lovely and fit well!!! It's a heavy ring so we got a half size down so it won't fall off =S but it looks great and my fiance loves it =) the eternity design does go all the way around the band uninterrupted, it's not raised or indented. Fingerprints show up on it easily and are easily wiped away but I think it's sort of neat. Very happy with this choice. Overall, an awesome ring. My fiance loved it because he said it had infinity symbols on it like our eternal love awwwww. :) I am very happy with this ring, it looks beautiful in sunlight. It also came unengraved in 2 days as promised. Thank you Titanium Kay! THE RING WAS PERFECT! THANKS SO MUCH! THE ENGRAVING COULD HAVE BEEN A LITTLE BIGGER! WE THOUGHT IT WOULD GO ALL THE WAY AROUND THE RING! Our rings are beautiful and we are so very happy with them. My husband and I love this ring! It fits great and looks fantastic!! It arrived earlier than expected both times we ordered! We highly recommend this ring and this company!! Titanium Kay is wonderful! !